The Metro Board of Directors are meeting today at Metro headquarters adjacent to Union Station. The agenda with links to staff reports is above. You can listen online here. •The Board approved the consent items. Item 36 was moved to the non-consent agenda and approved. •The Board approved beginning the formal environmental studies for a Measure M project to speed up the Orange Line with crossing gates and a mile-long bridge. An amendment asked Metro to also study other possible grade separations. See this post for more about the project. •The Board approved all-door boarding for the Rapid 720 bus on Wilshire Boulevard and the Rapid 754 on Western Avenue, both in 2018. More in this post. •Los Angeles Mayor and Metro Board Chair Eric Garcetti said that L.A. County officials will be meeting with their counterparts from Orange County next month to discuss regional transportation issues — including transit, ExpressLanes and working together to prepare for the 2028 Summer Olympics and Paralympics. Garcetti also said that he’s looking forward to the Board next month taking up items related to turning smart phones into virtual TAP cards and hiring a firm to help Metro restructure and reimagine its bus network. •Metro CEO Phil Washington, in his CEO report, said that Metro recently signed a contract with New Flyer for 100 zero emission buses at the American Public Transportation Assn.’s annual meeting in Atlanta. Washington also said that Metro had received an unsolicited proposal for a joint development at the Blue Line’s Artesia Station in Compton. The development, as proposed, would include office, retail and residential and Metro has decided it will advance to the second phase of consideration. •Many public commenters provided testimony on a proposed rail yard along Van Nuys Boulevard for the East San Fernando Valley Transit Corridor project, which is a bus rapid transit or light rail line between the Orange Line and the Sylmar/San Fernando Metrolink Station. 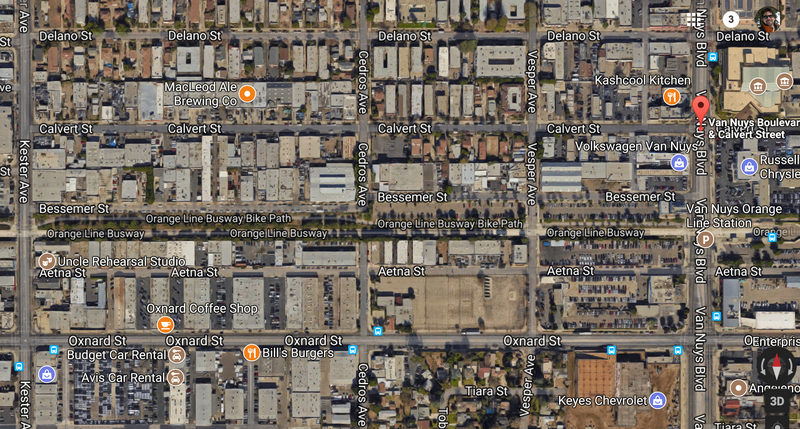 The rail alternatives would require a rail yard to be built and one of the proposed locations (Option A) would require Metro to acquire dozens of properties in Van Nuys between Van Nuys Boulevard, Kester, Oxnard and Calvert. Here’s a map below and here’s the chapter in the project’s draft environmental study that spells out the costs in terms of jobs and real estate. One thing I want to stress: the Board has not yet made a decision whether this project will be bus rapid transit or rail. As explained in the earlier Source post, Metro has $1.33 billion in funding for the project and, as studied and currently configured, the rail alternatives are estimated to cost twice that. It’s also important to know that there appears to be strong support in the community for the rail options — and some of the people who don’t like Option A for the rail yard also spoke in favor of the project being built as a rail line. It was a good session of public testimony — and a chance for the Metro Board, who are often the ultimate deciders at the agency — to hear what has been said in the media and meetings for this project. This is the way the process should work. Staff makes a proposal, the public vets it and says what they like — and don’t like. Comments on the draft study can be emailed to eastsfvtransit@metro.net or left on the project hotline at 818.276.3233. All comments must be received by 11:59 p.m. on Oct. 30. Finally, here’s the project home page. •There was a wide-ranging discussion on the ExpressLanes and enforcement prompted by recent staff and media reports that an estimated 25 to 30 percent of cars in lane are avoiding paying tolls by setting their transponders to the wrong setting. The California Highway Patrol reported that on average about 1,300 citations are issued in the ExpressLanes for all violations — the majority of which are for wrongly setting the transponder or not having a transponder. The CHP said more enforcement could be done — if Metro wanted it. Metro staff said they feel the level of enforcement is appropriate and that more enforcement may not be helpful in terms of traffic flow. That, in turn, brought forth a more philosophic conversation about HOV lanes, ExpressLanes and what Board Members think works — and doesn’t work. Board Member John Fasana pointed out that 1,300 citations a month isn’t very much given that a vehicle lane can carry 1,800 vehicles per hour. Fasana and Paul Krekorian said they weren’t sure that current HOV rules even work. “We’ve taken away 20 percent of through put by taking a lane away and the benefit we get from that is very difficult to define,” Krekorian said. Sheila Kuehl reiterated that she’s not crazy about the concept of ExpressLanes, whose primary purpose she said is to make money. “Originally these were not toll roads, they were freeways, and I would like to keep most of them that way,” she said. Ultimately, the Board asked for some more reports about the ExpressLanes and suggestions for possible state legislation. Caltrans is already looking at upping the HOV requirement from two drivers to three to help reduce HOV lane congestion, but it’s clear the Board is still very much trying to decide how best to use HOV and ExpressLanes in our region. It’s an important debate. As Fasana noted, while the rail system here is expanding and will offer more options to more people, the vast majority of trips in the years to come will be on our freeway network. Blue Line Artesia Station: Currently very limited parking, reasonable bus connections, in an industrial zone right off the 91. Curious as the unsolicited proposal of office, retail and residential. IMHO office has a financial chance, retail would never make it, and residential? Maybe a ten story high density. The real shame is the lack of parking. I know that Metro wants us out of our cars completely, but stations near freeways and large arterial streets will always need more parking. Witness the Norwalk Green Line lot with 1500 spaces full at 0630. Well said. L.A. County is a lot more than the City of L.A. and its few urban niches. Depending on the Retail business, with the building of the Residential and Office space retail could do very well at the Artesia station. Being that this project is being built at a Blue Line station consumers from around the area may find it convenient to utilize the train to do their shopping at the Artesia Station. I don’t think it’s fair to compare the parking needs of a terminus station on the Green Line to a mid-way station on the Blue Line. As experienced in the recent Gold Line expansion, parking needs are always much greater at the end of the line compared to in the middle. Once the extension opened, the previously end of the line stations saw a large reduction in the utilization of parking spaces. That said, there will likely be additional parking built regardless because of the new development and parking minimums in zoning law. I have a question about discussions for the East San Fernando Valley Transit Corridor project. Will there ever be a study of how joining this to the Sepulveda Corridor project would impact the combined budget for both? If both projects were BRT, I could see the answer might be “not in the slightest”. But if both projects were rail, then the impact of combining them could easily go into the hundreds of millions. For example, having one single station for one rail line would be less expensive than some sort of intermodal station, and the price of going subway instead of surface would be shared. The rail yards could be another big-ticket item for cost sharing. It would be a shame if the project were done as surface rail for cost reasons, only to discover ten years out that a Sepulveda tunnel would require much of the same construction to be done anyway. Or, if having two rail lines terminating in an intermodal station was actually more expensive than running through in a subway. As a daily commuter who parks at the Artesia Station, RENEGOTIATE OPENING THE WESTERN STATION ENTRANCE. Who cares if the casino complained? There is a whole shopping center with food and shops that would be in walking distance of the station. But instead, patrons have to make the over mile long trek to the station or walk along the Union Pacific tracks. It would be so much more convenient for those who do not have cars or are not near bus lines that serve the station. Just don’t give free toll option in HOV would be the best solution. Drivers in LA are very dishonest and never obey the rules. It’s also unfair to riders who use silver line/commuter buses daily verse drivers who can cheat the system by setting wrong the transponder and pay nothing to use it. It’s just like the concept of stealing things. People have the options to use the ExpressLanes, but you guys also have the options to increase the toll fees, convert it to permanent toll roads, and even convert one line to bus line only during peak hours. Yes. Metro should consider eventually transitioning one of these lanes to bus-only.